When fire strikes, your home could be engulfed in smoke and flames in just a few minutes. 78% of all fire deaths occur at home. Be safe, have 2 ways out! X-IT is the only emergency ladder designed to fit all window widths and wall thicknesses - how it works. X-IT is the only portable emergency ladder that offers a permanent mount accessory bracket. 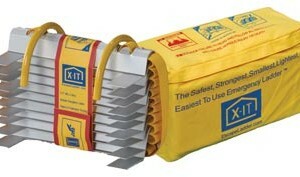 X-IT exceeds ASTM F2175 safety standards for portable and permanent emergency escape ladders. Chain, rope, and plastic step escape ladders are older designs that do not meet current safety standards. X-IT advises safe practice with your X-IT ladder by reading all instructions, deploying your X-IT ladder, then climbing up a few steps from the ground - repack and be prepared. Fox News independently tested emergency ladders and recommended X-IT as the best. 60 day full refund guarantee. 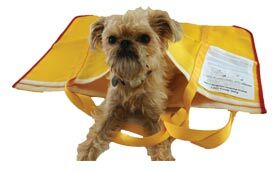 + 15 Year Limited Warranty for material and workmanship to the original purchaser. 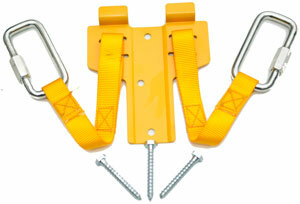 + Lifetime replacement; use your X-IT Ladder in a documented emergency and X-IT will replace it free of charge. The International Design Society of America recognized the X-IT ladder with a design award. The New York Museum of Modern Art displays the X-IT ladder in its permanent collection. Don't be fooled by copies; support innovation and small business, buy the original X-IT Product and please tell your friends. We love our X-IT ladders! ...we are happy with (x-it) ladder! ...thanks for all of the customer service! It's rare these days and greatly appreciated! We tried it out -- nice design that works great! Thanks for answering all my questions and getting the product to us quickly. I'm very pleased with this product and would recommend it to anyone with a second story. I also value the higher safety rating of your ladder compared to its imitators. ...even if kidde gave me a ladder for free i would still buy from you. Be the first to review “Baby / Pet” Click here to cancel reply. Be the first to review “Permanent Mount Accessory Bracket” Click here to cancel reply. Fire Escape Ladders © 2019. All Rights Reserved.